"I am the way, and the truth, and the life; no one comes to the Father, but through Me” (John 14:6). My life was filled with sadness before I came to know Christ as my Savior. In 1979 an evil group of communist rebels called the Sandinistas attacked different sections of the country of Nicaragua in Central America. The communist guerrillas took over the city of Octotal where my family lived. Many thousands of innocent people were killed including women and children. My father was a military officer in the democratic government. I was 18 years old when the Sandinistas kidnapped my father and murdered him in the mountains. This was the saddest time for my family and me. My mother is a beautiful Christian and leader in a Baptist church where I grew up. During this disastrous time my mother was faithful to the Lord, prayed for me, and always looked to the Lord for her strength. On the other hand, all I wanted to do was get vengeance for the violent death of my father. I was filled with so much hatred that I wanted to kill with my own hands the first Sandinista I found. I was filled with evil thoughts when a group of Contras, who were against the Sandinista revolution, invited me to join them in their meetings. Their goal was to avenge the deaths of our fathers. My mother saw that I was not walking in a good way. She always said, “My son, vengeance is in the hands of God. We must trust Him to do justice.” I told her that I did not believe in God, and that I wanted to kill those who killed my father. My mother cried and prayed for me all the time. Several years passed by when I felt in my heart a great emptiness. I visited an evangelical church. My mother was very happy when she heard that I was visiting the church. But I was a youth in rebellion. I was addicted to drugs and a lot of other things the world offered. One afternoon, in desperation, I came home from working in the field and wanted to speak with my mother. Neighbors told me she was at the church; so I went there. A large group of believers had gathered, and much to my surprise I learned they were praying for me. At first I was angry and resented it. Then I was overwhelmed by a deep conviction of my sins and the pastor shared with me the good news that Jesus Christ died for all my sins and rose from the dead. I put my faith in Christ as my Savior in 1983. Because of the Sandinistas my family and thousands of other Nicaraguans were forced to flee across the border into Honduras. 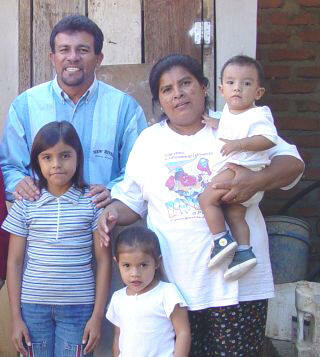 Baptist missionaries worked with the refugees in El Paraiso and Danli. They took me in and taught me the Scriptures and how to grow in Christ. God called me to the Gospel ministry and I was invited to study for four years at a Baptist Bible Institute in Tegucigalpa. After graduation I taught in the institute for four more years. During the next 18 years I went out with medical dental evangelism teams from the United States and did music evangelism and preaching. During those same years I have worked with other pastors in Danli, Honduras, where I live and we have started a dozen churches here. In October 2004, I sensed the Lord leading me to devote myself fulltime to church planting and pastoring the Alpha and Omega Baptist Church. I had the privilege of starting this church in Danli several years ago. We have six missions with their own pastors and we are opening up new areas. Naomi and I have three children: Linda (9), Ashley (3), and little Juan Alberto (1). Wil Pounds and I have been working together on mission teams for the past ten years. In our work with the rural pastors we have been burdened for those who have never had a chance to get a formal Bible education and adequately prepare for ministry. We both sense the Lord’s leading in our lives to start seminary extension courses for these rural pastors. 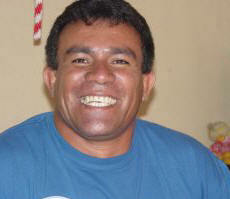 In January 2005, Wil taught the first of ten courses to 47 pastors and church leaders. We are busy now with classes in 2006. Pray for our ministry here. Partnership mission’s gives you an opportunity to become personally involved in what God is doing in world missions. 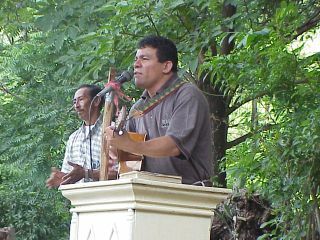 Pray daily for Juan Alberto Herrera and Noami and their ministry in Honduras. Pray for the Alpha and Omega Baptist Church and its missions in Danli, Honduras. 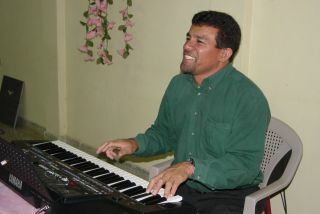 Juan Alberto Herrera Ministry. He also serves as pastor of the Alpha and Omega Baptist Church and its missions.